Eases skin irritations, rashes, itchiness and is said to help ease eczema (I am not a doctor nor a dermatologist therefore always check with a professional). 8 drops grapefruit essential oil (optional – you can use any oil of choice but if you are pregnant do not use any essential oil). *If you use the powder I would recommend putting it in a coffee filter or cheese cloth to help keep the oil and powder separate. NOTE: I am not a dermatologist nor a doctor. I provide this for informational purposes only so please consult with a professional before you apply anything new to your skin or hair. Should you be taking medication or creams from a medical professional please do not replace that with my DIY recipe – consult your medical professional first! If you are allergic to any of the ingredients I use do not use them. Do a small patch test on the inside of your arm when trying anything new before applying it all over your hair/skin. Always ensure to dilute the Essential Oils (EO) in a carrier oil as they can cause skin irritations if used undiluted. If you are pregnant you should NOT use any EO. If you try this please let me know how it turns out. If you make your own Infused Neem Oil I would love to hear from you! This entry was posted in Ayurvedic Herbs for Hair, Ayurvedic Hers for Skin Care, Ayurvedic Oil for hair, Ayurvedic Oil for skin, Coconut Oil for hair, Coconut Oil for skin, DIY Ayurvedic Oil for hair, DIY Ayurvedic Oil for skin, DIY Infused Oil for hair, DIY Infused Oil for Skin, DIY Infused Oils, Infused Neem oil for hair, Infused Neem oil for skin, Neem infused cococnut oil, Oils for natural hair and tagged Ayurvedic herbs for hair, Ayurvedic Hers for Skin Care, Ayurvedic Oil for hair, Ayurvedic Oil for skin, Coconut Oil for hair, Coconut Oil for Skin, DIY Ayurvedic Oil for hair, DIY Ayurvedic Oil for skin, DIY Infused oil for hair, DIY Infused Oil for Skin, DIY Infused Oils, Infused Neem oil for hair, Infused Neem oil for skin, Neem infused cococnut oil, Oils for natural hair on November 20, 2014 by Maicurls. 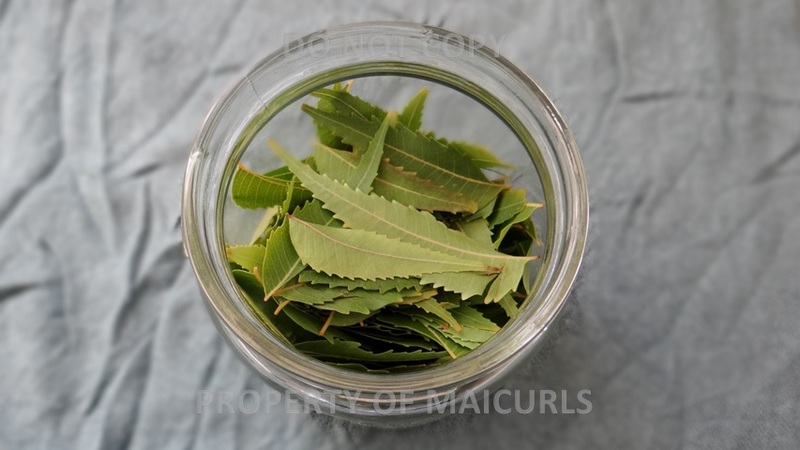 This is going to be a post all about Neem, Infused Neem Oil to be specific. As a part of my “Infused Oil Series” I also make Neem Infused Coconut Oil and will have a video & writeup of how to make it shortly. For now I just wanted to point out the reasons why I like the oil and why you might want to try it. Like a lot of Ayurvedic plants & hebrs, the Neem tree is located mainly in Asia and is most predominantly popular India. Its leaves, nuts, twigs and barks can be used for Ayurvedic purposes. Pure Neem Oil that is cold pressed from the whole nut is exceptionally rich and full of nourishing properties as well as Vitamin E and essential fatty acids, but the one “negative” aspects of pure Neem Oil is that it has a strong pungent smell. However, if you can stomach the scent, your skin and hair can benefit greatly from its nourishing properties. I of course use an infused version of the oil since I can not make the cold pressed version at home, so mine is not as strong however, I still get benefits from infusing the leaves (it is also not as “smelly”). Neem Oil and Neem Infused Oil can be used for your hair and skin thanks to its multipurpose properties. Where can I find Neem? There are a few websites online that actually sell Neem powder such as Butters n Bars. If you have a local Indian store nearby look out for the Neem Hesh brand locally otherwise check the ethnic section of your super market. If you have Neem trees readily available to you, you can use the leaves and/or make your own powder by blending up dried leaves. If you do blend the leaves it might end up being a little bitty so it is best to put them in a coffee filter or cheese cloth. If you want to use fresh leaves then you need to use the oil up after production because otherwise you WILL grow bacteria in the container. 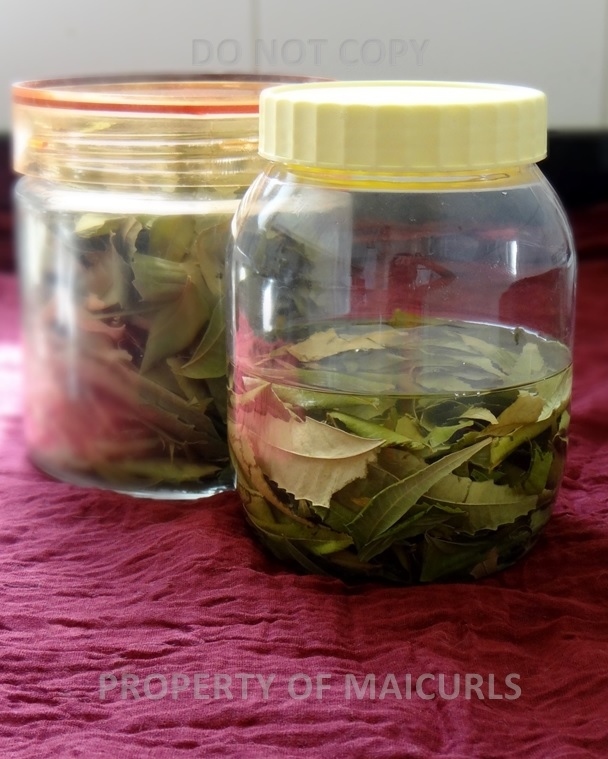 For infusing – you will need to use either dried Neem leaves or powder. Its natural antibacterial, antifungal, and antiviral properties can help ease skin irritations, rashes as well as relieve itchiness (which can affect the face, body and scalp) . It is said to help ease eczema (I am not a doctor nor a dermatologist therefore always check with a professional). It can help reduce the appearance of light burns and scars – if massaged on the skin regularly and frequently. The oil can help reduce hair shedding and strengthens the hair to help reduce breakage. Neem is also known to help slow down premature graying & the appearance of grey hairs due to the fact that it is known to naturally and gradually darken the hair*. It provides the hair with shine, luster, works as an excellent sealant and helps to promote hair growth. *You will not end up with jet black hair but it can darken the hair and has a similar effect on light, bleached or blond hair and if that is not something you want then I would suggest not using this oil. Stay tuned for my how to video and writeup Maicurlies! Have you used Neem oil or Neem infused oil before? If so how do you use it and what do you think about it? I would love to hear from you. This entry was posted in Ayurvedic Herbs for Hair, Ayurvedic Hers for Skin Care, Ayurvedic Oil for hair, Ayurvedic Oil for skin, Coconut Oil for hair, Coconut Oil for skin, DIY Ayurvedic Oil for hair, DIY Ayurvedic Oil for skin, DIY Infused Oil for hair, DIY Infused Oil for Skin, Infused Neem oil for hair, Infused Neem oil for skin and tagged Ayurvedic herbs for hair, Ayurvedic Hers for Skin Care, Ayurvedic Oil for hair, Ayurvedic Oil for skin, DIY Ayurvedic Oil for hair, DIY Ayurvedic Oil for skin, DIY Infused oil for hair, DIY Infused Oil for Skin, DIY Infused Oils, DIY Neem infused coconut oil, DIY neem infused coconut oil for hair, DIY Neem infused coconut oil for skin, DIY Neem infused for hair, DIY Neem infused oil for skin, Neem infused oil for hair, Neem infused Oil for skin on November 17, 2014 by Maicurls. I will be sharing how I make my DIY Amla Infused Grapeseed Oil. Before I go any further I want to mention I was not requested or compensated for anything used in this DIY recipe. All products used were paid for with my own money. Amla oil is said to help darken the hair so if you do not want this attribute then this recipe might not be the one for you. I also wanted to provide a write-up so here we go Maicurlies! *NOTE: I am not a dermatologist nor a doctor. I provide this for informational purposes only so please consult with a professional before you apply anything new to your skin or hair. Should you be taking medication or creams from a medical professional please do not replace that with my DIY recipe – consult your medical professional first! If you are allergic to any of the ingredients I use do not use them. Do a small patch test on the inside of your arm when trying anything new before applying it all over your hair/skin. Always ensure to dilute the Essential Oils (EO) in a carrier oil as they can cause skin irritations if used undiluted. If you are pregnant you should NOT use any EO. I take out the filter and squeeze out excess oil. (You can run the oil through a filter or cheese cloth afterwards). I add 15 drops of Grapefruit essential Oil (optional) and that is it! I would love to hear if you have or will use Amla Infused Oil . I would also love to hear how you use the oil! 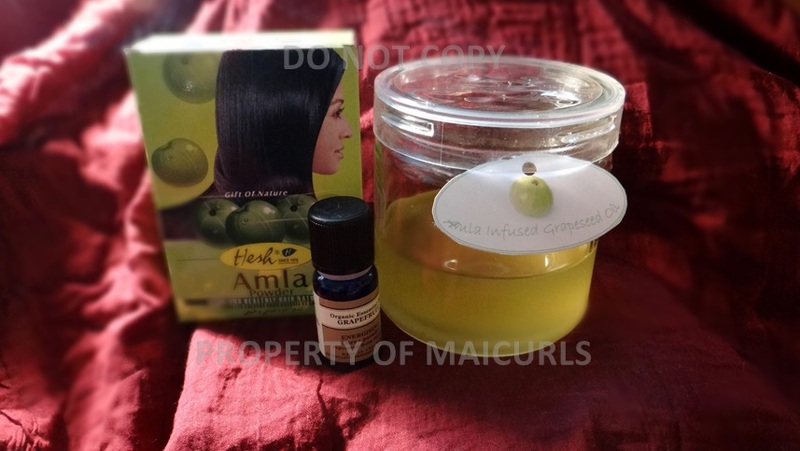 This entry was posted in Amla for Hair, Amla for Skin, Amla infused Grapeseed Oil, Amla infused oil, Ayurvedic Herbs for Hair, Ayurvedic Hers for Skin Care, Ayurvedic Oil for hair, Ayurvedic Oil for skin, DIY Amla Infused Grapeseed Oil, DIY Ayurvedic Oil for hair, DIY Ayurvedic Oil for skin, DIY Infused Oil for hair, DIY Infused Oil for Skin, DIY Infused Oils and tagged DIY Amla infused grapeseed oil, DIY Amla infused oil, DIY Amla infused oil for hair, DIY Amla infused oil for skin, DIY Amla Oil, DIY Hibiscus Infused Almond Oil, DIY Infused oil for hair, DIY Infused Oil for Scalp, DIY Rose Infused Grapeseed Oil, Infused Grapeseed oil, Infused oil, Naturally darkening hair on November 1, 2014 by Maicurls.